It looks as though the largest numbers of Goats were to be found at the brand new London Landmarks Half Marathon and the long-established Hendy Eastleigh 10K. 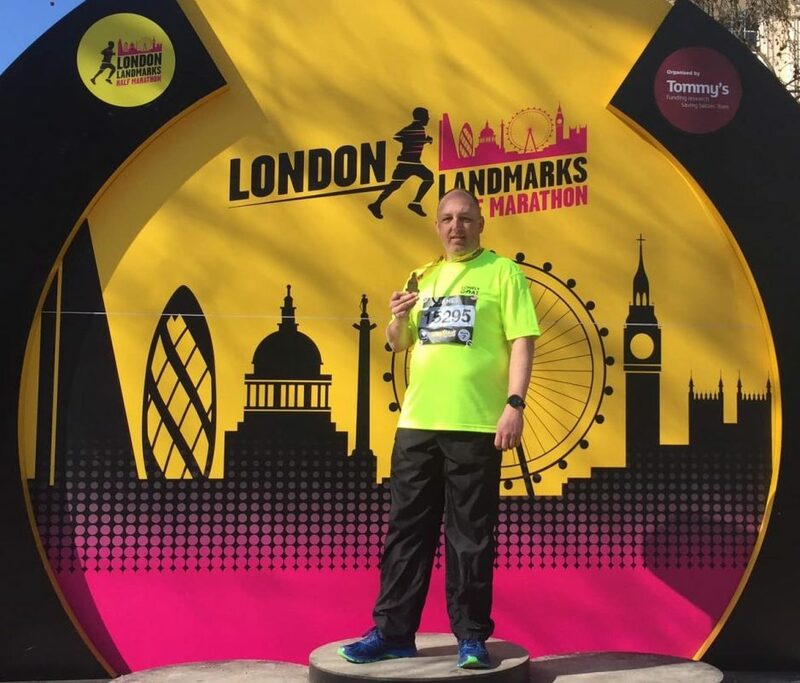 The London Landmarks Half Marathon offered the opportunity for 13,000+ runners to run on closed roads through Westminster and the City of London. It starts on Pall Mall and finishes by Downing Street, taking in views of iconic landmarks including Big Ben, St Paul’s Cathedral, Nelson’s Column, the Gherkin, the Shard, the Tower of London and the London Eye. Goats who ran the LLHM included Sharyn Eilertsen (2:52’50”), James Powers (3:06’30”) who is in the photo above, and David Williams (1:27’49”). 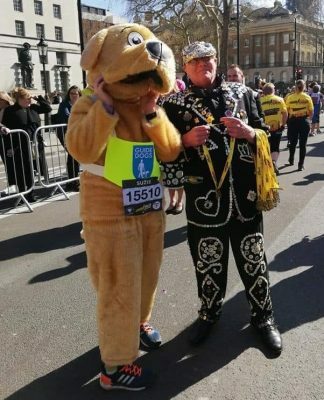 Special mention has to go to Suzie Walker (3:39’41”) who ran dressed as a guide dog! The Hendy Eastleigh 10K was celebrating its 35th anniversary. The course is renowned as being fast and the race advertises itself as “the home of the PB” with previous editions of the event won in under 30 minutes! No doubt this is why it attracted so many Goats. Amongst them were David Ball (43’38”), Christos Katsogiannis and Vasilis Papageorgiou (both 54’40”), Kerry Gale (52’18”), Richard Kneller (47’40”), Erica Maggs (1:12’39”), and Gordon Way (1:11’20”). As well as London and Eastleigh, there were plenty of other events taking place all over the country. A whole herd of Goats, including Claire Hatwell, completed the Tamar Bridge 10K. Chris Fryer ran the Hastings Half Marathon, describing it as a “top day” in his home town. Louise Roberts and Phil Saunders completed the challenging Stafford Extreme Warrior 10K obstacle course race, getting nice and muddy in the process. Sandra and Wayne Price (2:30’10” and 2:30’13”) ran their first event as Goats at the Run Fest at Lee Valley Half Marathon. Also running was James Morris (2:07’11”). At the Ashby 20, Marie Sampson (3:17’20”) ran well to beat her target time. Finally, the Coventry Half Marathon had Goats in attendance, too. Gail Emmerson (2:03’34”) described it as having a “great course, sunny weather and fantastic support!”. Thomas ‘Teej’ Johnson (1:52’59”) ran despite being unable to run even 1.5 miles back in November. He attributes his improvement to the strength of “mind over matter”. Running dressed as Borat may have helped too! For many Goats, parkrun is the highlight of their running week. Poole parkrun had the largest turnout of Goats, with 14 present, but a couple of Goats managed to run much further afield… In the USA, Mark Callaghan ran at Lillie parkrun, in Ann Arbor, Michigan, while Jeremy Clarke represented the herd at Taupo parkrun in New Zealand. Of course, it’s not all about running organised events. Allan Bennett ran a solid 21 miles on Sunday, taking in Ironbridge along the way. That’s the goats on the run update for this week. Congratulations to all the runners mentioned, plus all those we missed. As always, if you’ve achieved something in your running that you’re particularly proud of – completing an event or otherwise – feel free to let us know about it in the Facebook Chat Group or use the #lonelygoatrc #lonelygoatrunninglcub hash tags on Instagram. Look out for more goats on the run next week.